The new workout machine from Nautilus is designed to sit in a garage and collect dust. The new piece of equipment, called the DZ9001 Spiral Elliptical Strength Pressure Sitter, is the first in the home gym market designed specifically to not be used. While the DZ9001 Spiral Elliptical Strength Pressure Sitter has a number of features that are designed to be confusing or difficult when used to exercise, but the gathering dust feature requires no set up or even involvement for the owner. According to Butler, the most interesting feature of the DZ9001 Spiral Elliptical Strength Pressure Sitter is that the machine will post it’s own for sale notice on Craigslist five years after it’s initial purchase. Consumers looking for home gym equipment are looking forward to the new equipment and several told The Scoop that they are already making room for the machine in the garage behind the snow sleds and their old camping equipment. 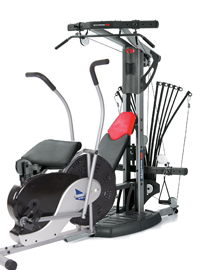 The DZ9001 Spiral Elliptical Strength Pressure Sitter will sell for $499. When the DZ9001 Spiral Elliptical Strength Pressure Sitter posts a for sale notice on Craigslist it will list “$50 O.B.O. – must come pick up” as the price. As a follow-up to the DZ9001 Spiral Elliptical Strength Pressure Sitter, Nautilus plans to unveil a line of exercise machines that will primarily be used as clothing racks.